Every so often you come across a songwriter that can capture your attention with a single phrase, a certain arrangement of words that turn into a story and end up as something rather meaningful to the newly enchanted fan. John Darnielle is one of those songwriters. For over two decades Darnielle has written and performed as the Mountain Goats, releasing lo-fi home recordings for years before moving to a recording studio with a band for 2002's "Tallahassee." The Mountain Goats will swing through Pittsburgh to play Carnegie Music Hall Tuesday, June 11 with bassist Peter Hughes for the first tour as duo since 2007, so I chatted with Darnielle about the tour, his time spent on Twitter, and what it's like to have fans try to get him named as the next U.S. Poet Laureate. Alex Bieler: Are you excited about going back and touring as a duo again? 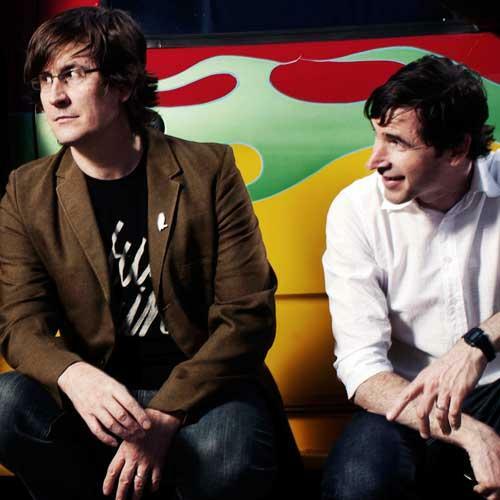 John Darnielle: Yeah, I am. We tried it in Poland last year. We hadn't played a duo show in a long time and we were kind of rusty [laughs]. We had a good time, but at that time we hadn't had a chance to meet up, we just got this spur-of-the-moment Polish offer and it was like 'Let's go to Poland.' So we tried it and it was really fun pulling a bunch of stuff [out]. [Peter]'s come down here to stay here and practice about three weeks ago. AB: So are you going to miss [drummer] Jon Wurster at all? JD: Working with Jon Wurster is the best thing. Not having Jon in the van means you have less fun. Jon is one of the funniest people alive, so having Jon around is always a plus. AB: You seem so active on Twitter. What really drew you to that platform? JD: Nothing really. The thing is, I was avoiding it. I'm not a tech-phobe or anything, but whenever there's a new technology and you have people writing pieces on how it's the next big deal, I can't stand that. So I always avoid them as long as I can, but then I wrote this song that I really wanted to share with people quickly and I thought, 'Well, what's going to be the quickest way to get it to the most people that would be into it,' and it looked like Twitter was where everybody was at. Once I got on, it's really cool if you're a person that has practiced condensing your phrases, which you do as a lyricist – that's cool to be able to try and express things in short bursts. That's a great discipline to have daily. Also, in terms of how I talk to people who are into music, it's a great place to be because the nature of it is sort of like being at a party, where you say, 'hello,' exchange words quickly, and move on to the next person. AB: Yeah, you seem to have a lot of fun with it. You had one tweet about going to Beantown, which read: "'OK let's see what's going on in Beantown, literally'- thing I said while checking beans on stove. I'm not sorry and I'd do it again." JD: [Laughs] Well, let's think about this. That's the other thing about it that really – if you are a person that sort of wants to be able to share, to give up yourself without having to give up your boundaries. If you say something funny to yourself in the kitchen, and you're like 'Oh, people that like my jokes might enjoy this,' it's a great level of engagement and it's really cool. AB: You've put out so many different songs. Do you know how many you've actually released? JD: I don't think it's actually that huge. I'm on autopilot when I talk about stuff like this, but if a songwriter were to write 15 songs a year, is it really a lot of songs for a guy who calls himself a songwriter? No, it's not that many. I do a little better than one a month, but I just think that's not much to ask of a songwriter. Back in the day, I think almost three-quarters of what I was writing was coming out, and I wrote all the time – especially with that whole style of songwriting, so much of it was about spontaneous expression about whatever idea I had right then. They all adhere to some pretty basic songwriting conventions; they weren't Gershwin. [Laughs] But if you look at Gershwin or Rodgers and Hart, those guys wrote a lot of songs, but if you're a songwriter, that's what you ought to be doing. AB: Do you ever get sick of playing certain songs or can you mix it up enough that it feels fresh all the time? JD: I don't get sick of them, but sometimes you'll find yourself skipping a verse, and it'll be like your body telling you that you are no longer thinking about it. As soon as you sing the first couple of words, you slip into the skin of it. There are people that have been doing "Cats" for 20 years, but when they think about going to do "Cats" then they're like, "Oh, I can't do 'Cats' again," but I'm certain that as soon as the curtain comes up, they feel different, because you are then in it. For me, that's the case, like I don't play "Going to Georgia" anymore, but we did play it for the longest time and I would think, "Oh, it's time to do 'Going to Georgia,'" and then as soon as it would start, I would get excited. It's hard to get sick of things, and if you feel that something is starting to get weathered, you just kick it off the set list. AB: I was listening to "The Best Ever Death Metal Band Out of Denton" and I noticed that the three band names that the people in the song were considering were Satan's Fingers, The Killers, and The Hospital Bombers. Any inkling in your mind that a certain popular band that might have listened to that song and gotten any ideas? JD: I don't know. Very shortly thereafter there was this New Order video where New Order played a fake band called The Killers where that band took their inspiration from. I would be shocked if New Order had thought 'This is a cool Mountain Goats song.' I don't really think the Mountain Goats are really on New Order's radar. AB: So are you waiting around for someone to call themselves Satan's Fingers? JD: Well, there are bands by both of those names now. If you watch Rian Johnson's movie "Brick" through to the end credits, you will see, as I did to my great surprise, in the music credits is The Hospital Bombers Experience, which is Rian's brother, so that was pretty exciting. AB: I never realized that, and I really liked "Brick." JD: Yeah, you have to watch it clear through the end. Rian has listened to my music for a long time, and we're friends now. But yeah, I went to see this movie, and I'm one of those guys that sits in the theater until the lights come up and the credits are rolling, and I'm looking and suddenly it says, "Music by The Hospital Bombers Experience," and I'm like "Are you kidding? That's awesome." AB: When you see these things that have been inspired by your songs, does it still surprise you? Does it touch you? JD: It's always moving. As far as surprised, I've been around a bit, I don't surprise easily. There was a guy, I feel like he's from Tennessee, but I know I saw him at the Asheville [N.C.] show who had a "Heretic Pride" tattoo and it was one of the coolest things I've ever seen. AB: People seem to really like you. I remember the petition to name you U.S. Poet Laureate that came out earlier this year. I actually created a whitehouse.gov account to sign that petition. AB: A lot of people ended up signing that. JD: I am actually now the Poet Laureate, we won. [Laughs] I didn't sign it myself because I think signing off on something like that for yourself is sort of gratuitous self-promotion. On the one hand, you do have to promote your art, but on the other hand, you try to resist going, "Hey, sign the thing about me." But I was really honored.